We shooters are always looking for ways to make the sometimes onerous job of cleaning and preserving our firearms easier and faster. Thus, the idea of a cleaner – lubricant – protectant surely has as much appeal to a hunter or recreational shooter as it does for the military. Such must have been the thought process when Frederick Klever, an attorney of all things, founded the German company that bore his name, to produce such an item for the Imperial German Army (Wehrmacht). I was passingly familiar with Ballistol back in the mid-1980s, when Heckler & Koch was the U.S. importer, but never had a chance to give it a try. It has now been produced in the U.S. for a number of years, using the original formula. A combination of medicinal grade mineral oil, alkaline salts, alcohol, Benzyl Acetate and oil from vegetal seeds created Ballistol, which is short for "ballistic oil." What is interesting about the product is the possibly unique combination of useful attributes it has. Not only will it maintain bores, treat leather, provide some weather protection to both metal and wood, it was also used to treat small abrasions and cuts and would work as cooking oil in a pinch. Other uses for the product include lubrication of car hinges, motorcycle control cables, electrical contacts and battery terminals to displace moisture and inhibit corrosion, protecting gel coat on fiberglass, as well as maintaining knives and garden tools. In addition, it will, when diluted 1:4 (25% Ballistol and 75% water) allow the neutralization of black powder residue. One can use a 10% Ballistol / 90% water to cancel the action of corrosive primers and skin acids, due to its pH of 8.0 – 8.5. It is also non-toxic and its ingredients are not carcinogenic, per a 1997 review by Health and Human Services. It does have a rather pungent odor, which some might find off-putting. It smells vaguely like spiced licorice. Use it in a well-ventilated area and all will be well. The product is biodegradable. Neither its use nor disposal will pollute air or water. It also greatly resists its own “plasticization,” e.g., how a regular petrochemical solution usually turns into hardened varnish when exposed to air over a period of time. I have provided small samples to several friends, which the company graciously sent upon my request. One, a former member of Special Forces, found the product a bit foul smelling, but said that it worked very well for cleaning and maintaining handguns. Another friend said that he has used it for nearly all of the tasks mentioned previously. For my part, I have used it on both of my cars, as well as my rifles and pistols. It has done good work to remove lead, copper, zinc and brass fouling. Allow a few minutes for it to penetrate before scrubbing with either a nylon or brass brush and cleaning is no longer a chore. Moreover, it can help moisten and preserve leather slings, as well as give some protection to oil-finished stocks. 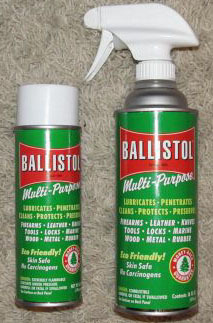 Ballistol is available both in aerosol and straight liquid form, in several size containers. I will add that using it rather sparingly is a good idea, as it has excellent penetration qualities and stays put, unless you overdo it. While it possibly won’t work as well in temperature extremes as a pure synthetic might, this 138-year-old product is a pretty good solution to that mythical all-around CLP. Copyright 2013 by David Tong and/or chuckhawks.com. All rights reserved.